I was tired of the same old lunch options. I searched for a new idea and Yelp led me to Cafe Volare. 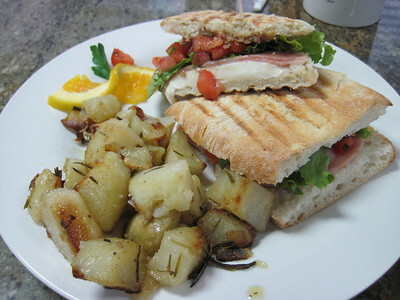 It's bright Italian cafe in a industrial business park that specializes in breakfast and lunch. My first visit I had the Classic Panini ($8.95) with roasted potatoes. I preferred classic with ham, arugula and cheese to the Caprese ($7.95). Subtle difference, but I like the addition of ham next time I'll upgrade to prosciutto. These paninis remind me of those I had in Italy. They are simple, fresh and tasty. The roasted potatoes are rich with rosemary flavor and satisfying. I'm yet to try breakfast or pasta. Maybe next time?